It was only a few days back when the Kinect hardware for the Xbox 360 got hacked to run on a Windows 7 PC. The fun doesn’t stop there, thanks to the recently released open source drivers for Kinect, it has now been hacked to run on a MacBook Pro running Mac OS X ! Check out the video after the break. Currently though, Kinect on OS X doesn’t work the same way as it did on Windows 7, where you had complete control over it’s motors and all. But the potential for all that is there. Imagine being able to browse the web, swipe pictures, and play video games in Kinect-style with this new controller on your PC or Mac. You can grab Libfreenect tools on the developer Theo Watson’s video page here, along with the complete source code. If you’re a developer, then give it a shot and see if you can get the Kinect hardware working to it’s full potential. 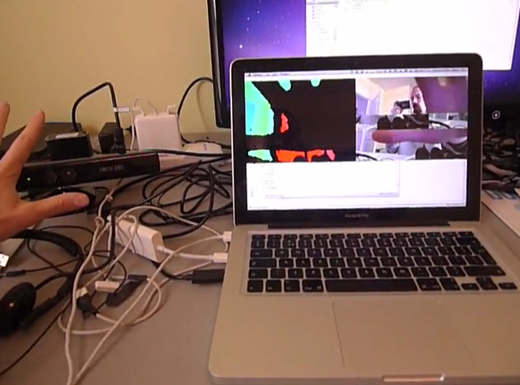 UPDATE: Kinect can do multitouch too!